Overkill . Nice way to make a mainspring barrel . most mainspring barrels have a snap on lid that is flush with the non gear end of the barrel. Here we see a cap that is snapped onto the barrel and secured with 4 tiny screws . Being dirty wasn't what stopped this clock . How in the world did a small thread get into the movement ? The thread got all tangled up in the clocks second wheel . Its not a reference to seconds , it's the second wheel up in the gear train . A platform escapement together and appart . Not a very hi quality escapement . before cleaning . After putting it on the cleaned clock it works great . 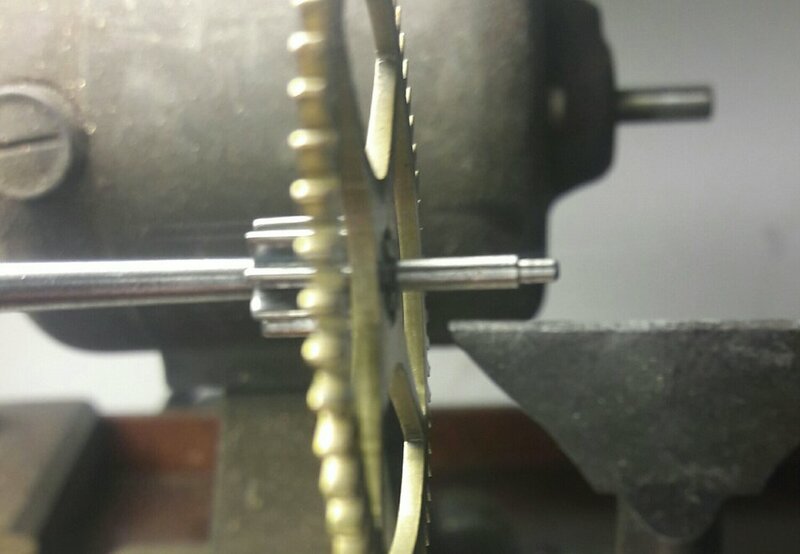 Two ways to cut gear teeth . 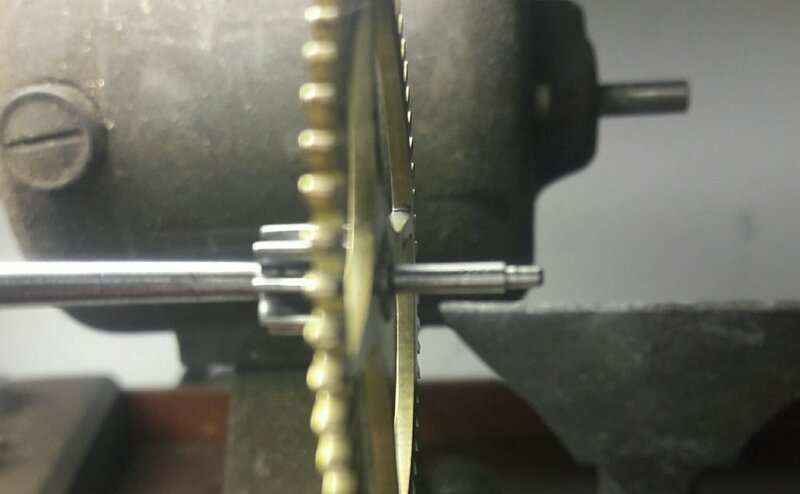 The top mainspring barrel is the right way to cut the teeth . On the bottom one they put the blank wheel on the brass tube with solder . Then they cut the the desired number of teeth . The result is teeth cut into the barrel it's self . You never know what you will come across in clock repair . A nice movement out of a slight grandfather clock . This movement has three songs and automatically shuts it's self of at 10 o'clock at night and turns back on at 7:15 In the morning. After twenty years of running it finally stopped. If you look at the steel pinions you can see the gunk that is now interfereing with the clocks ability to run . A brass gear drives a steel pinion . 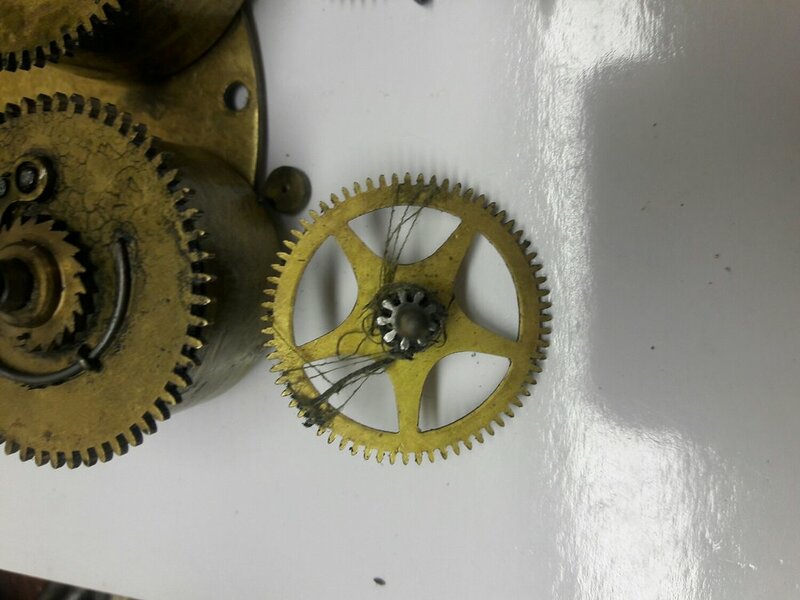 The brass teeth can no longer push through the gunk so this clock will be overhauled . How I mark a part for reassembly. Sometimes you have to mark a part to make putting a clock back together easier . I've seen X' s and the word "out" scratched into parts . In this case I put a tiny dot in between the two top holes . I know the dot faces out and it also is the up direction when it gets put back in place . A nicer way to treat the movement without putting scratched in words or symbols like the X' s.
before turning a half of a rotation . A half of a rotation . Notice how close to the tool rest the shaft is now. Unbelievably this gear came out of the movement like this . My customer said it was running for years . All I do to straighten it is tap on it with a small brass hammer. Rotate , tap , rotate , tap ..... I use my cell phone camera for these pictures so some are better than others . This is what happens if your not super careful and patient. 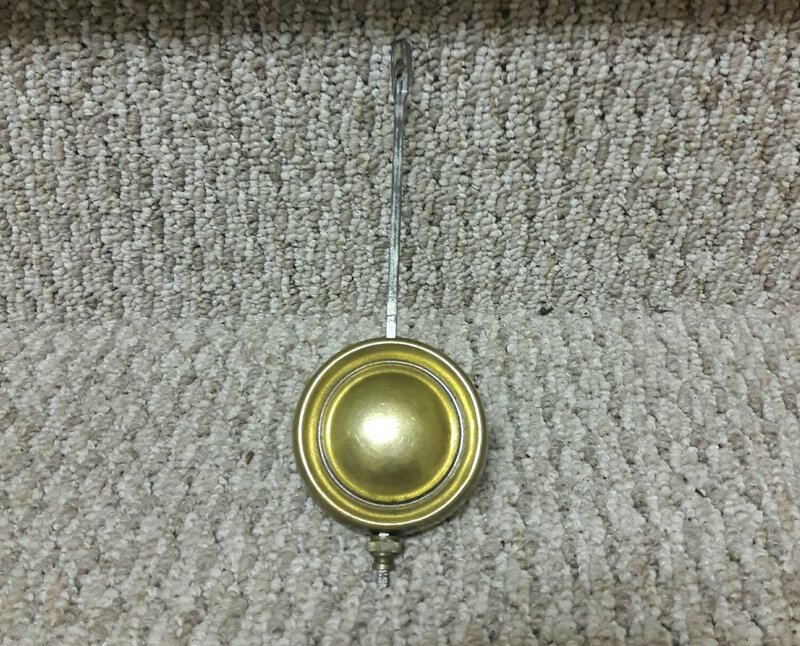 This is the middle hole on an antique clock's back plate . This is the gear that the hands go into. 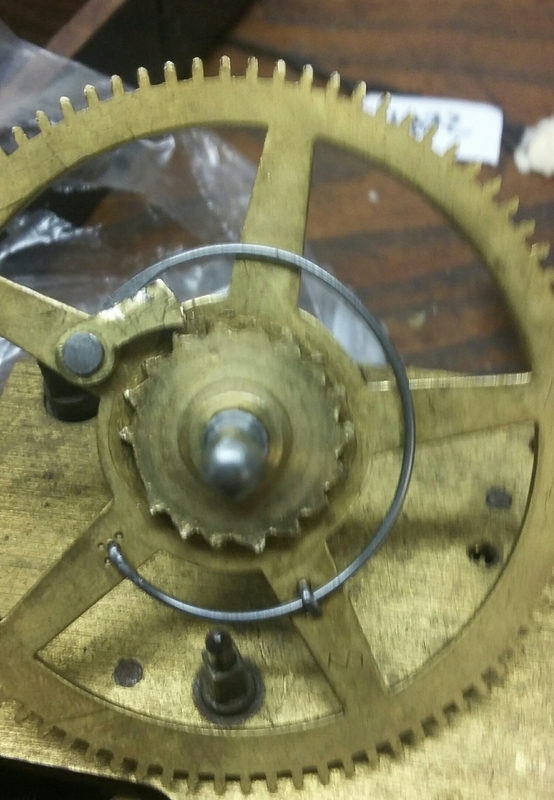 We can see that when the clock was being assembled someone kept missing the hole dragging the pivot of the gear back and forth and scratching the brass . These grandfather clocks are very well made . This could be a repair from a hundred years ago , who knows . Just a peek into the past . This clock runs like a charm . It's had a couple of hundred years of repairs done to it and keeps amazingly great time . It's driven by two small weights and a metal rod pendulum. most pendulums work the same . The style of the pendulum is just for looks . If the bob goes up it speeds the clock up . The regulating nut can be seen at the bottom of the bob . So if you turn the nut from left to right it will speed the clock up . From the right to left slows the clock down . Make sure the bob is sitting on the nut when you do this . Some bob's stay where they are and you have to slide it down to sit on the nut . Make sure to set the clock on the real time before you walk away from it . Call me if there's any doubt . Sometimes it can be tricky or take awhile but you can do it ! This German wall clock came into my shop for an overhaul . The moth is stamped into a brass center piece . i see lots of clocks and i really like this dial . 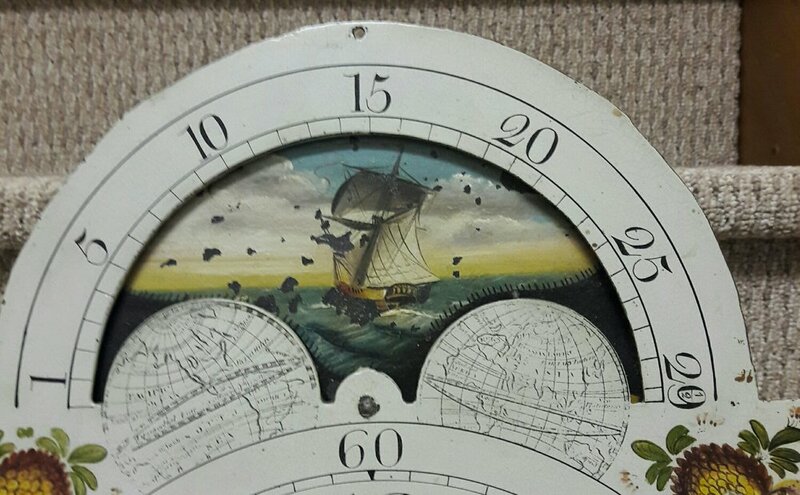 A light house and a tall ship on this moon dial. How cape cod is that . This grandfather clock is in for an overhaul . A cuckoo clock that needed to be oiled . This cuckoo was missing it's Pendulum and needed to be oiled . I usually try to avoid modern cuckoo clocks because often the repair is more than the value of the clock . Luckily the oiling did the trick . Movie prop from "The golden boys " movie shot in Chatham . I set up the clock shop window on main st. in Chatham . They let me keep the sign when they finished the movie . A nice clock dial . 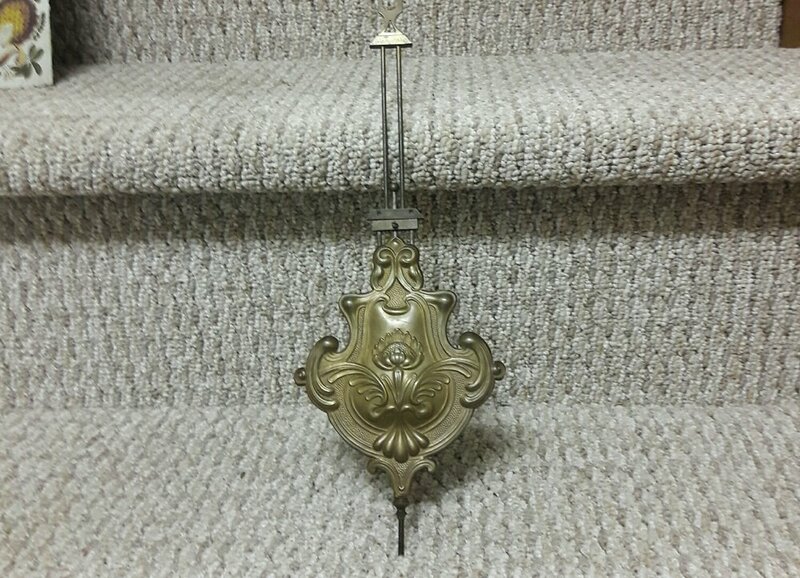 This is an antique grandfather clock dial that is on a rope driven movent with one weight that drives two gear trains .It only runs for one day per Winding . Clocks history is better than the clock its self. This black mantle clock was shot with a 22 cal. . I overhauled the movement and it runs fine now . The movement had no damage at all . Like I always say ," You never know what you will run into in clock repair ." This doesn't happen very often . In this clock you can see the lantern pinion is rubbing on the right hand side of the wheel that drives it . I moved the lantern over so it's now being driven in the middle of the cage . The ratchet teeth on this main wheel are terrible . The one at about 8 o'clock is missing . I took the gear apart and refilled all the teeth and dressed up the pawl ( aka the click ) . Put the clock back together . Should have taken an after photo . Next time I will . Here I'm just showing some of the problems you can run into . This all of the parts to a grandfather clock . Each one will be inspected before assembly . Very time consuming work . I look for wear and bent or cracked gear teeth . Bent or worn pivots ( that's the part of a gear that passes through the front or back plate ) . Also rust is a factor too. I sit down with a loupe and check each piece . Then put it all back together.